I like to call it the “quarter-life crisis”. Out of college & in the “real world” for a few years, and suddenly panicking about whether the job you have now – the one you worked so hard in high school and college to land – will lead to a fulfilling and gratifying life-long career. Studying towards my Masters in Developmental Psych. at Teachers College, Columbia U., I was certain that my passion was to work with children in some capacity, but I found myself at a crossroads, with 2 outstanding career opportunities – a very fortunate “problem” to have! Children’s Media or Speech and Language Therapy? Although they seem like wildly different professions, they are actually quite intertwined. Exposed to several Language Development & Speech Therapy courses in my program at Teachers College, I decided to explore the SLP profession in the actual field. I was privileged to meet with Speech & Language Therapist, Lauren Turk, M.S., CCC-SLP, who kindly allowed me to shadow a few of her therapy sessions in school settings. Ranging in ages from 3-16 years, and with a variety of different speech & language disorders, her clients did have 1 important aspect in common: the comforting & motivating environment that Lauren carefully established. It was inspiring to see how a speech therapist can really make an impact on a child to live a better, more fulfilled life. There has been a greater awareness about the importance of early identification of speech, language, swallowing & hearing disorders in young children, but people may not necessarily know who to approach, or how and when to get treatment. Luckily, Lauren Turk has devised a new website, TherapyfindR, which enables parents to search for qualified therapists by zip code. Search results display profiles of therapists with their personal description, credentials & specialty so the family can carefully select the therapist that is right for them. The site is a FREE service to help you find the right therapist for your child’s unique situation and needs. 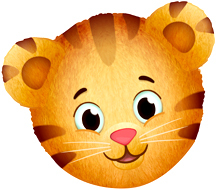 As for me, I simply could not leave the children’s media world (Have you seen how cute that Daniel Tiger is??). My work as Associate Producer at Out of the Blue enables me to enrich children’s lives, & particularly their communication skills, in a slightly different way, but I feel that my (brief) exposure to the SLP career has shaped the way I view educational children’s television: While I feel I am able to reach and make an impact on many more kids at once, it is important to keep in mind that each and every child behind the screen has distinctive strengths & weaknesses and comes from a unique family & school environment. Thanks again to Lauren Turk for opening my eyes to the significant field of SLP, and make sure to check out her new site at www.TherapyFindR.com! Alexandra Cassel is Associate Producer at Out of the Blue Enterprises, LLC. She is completing her M.A. in Developmental Psychology at Teachers College, Columbia University. Alexandra received her B.A. in Psychology and Media Studies from Colgate University.